Landscape design is an art unlike any other--a fusion of function and form sketched across nature’s ever-changing canvas. Under the guidance of owner John McCaughey, our designers blend horticultural science with aesthetic traditions, creating outdoor spaces that live and grow alongside you for years to come. If you have an idea--a dream--for your landscape, share it. We’ll use it as a seed to create an outdoor space you didn’t think was possible. One that will not just function--but thrive. One that will not just please--but astound. In the end, we all want a home to escape to. Somewhere to live out life's beautiful moments with the ones we love. Landscapes are an essential part of what brings that all together. Imagine kids playing soccer in the backyard without the azealias blooming behind them and grass beneath their feet. The summer nights without your outdoor fireplace glowing and the patio beckoning for cocktails. The times we share outside--surrounded by our favorite perennials, screened by a row of Green Giant arborvitaes, or relaxing by the hardscape pool--are the moments that last forever. Creating the setting you want, to be happy with what you see as you walk outside, is as important as choosing your house in the first place. When clients come our way, they're in search of a landscape transformation that will align their dreams with reality. Sometimes it's a simple front yard design with new perennial garden beds and a flagstone walk. Other times it's a master plan with hundreds of plantings and endless square feet of old stone hardscaping involved. In every case, our designers listen intently first and foremost, getting a solid grip on what will make the landscape work. How can it be adjusted, within the budget given, to provide the most enjoyment? How will the aesthetic considerations meld with the functional necessities? These are questions that years of experience and education have answered before and will continue to do so moving forward. 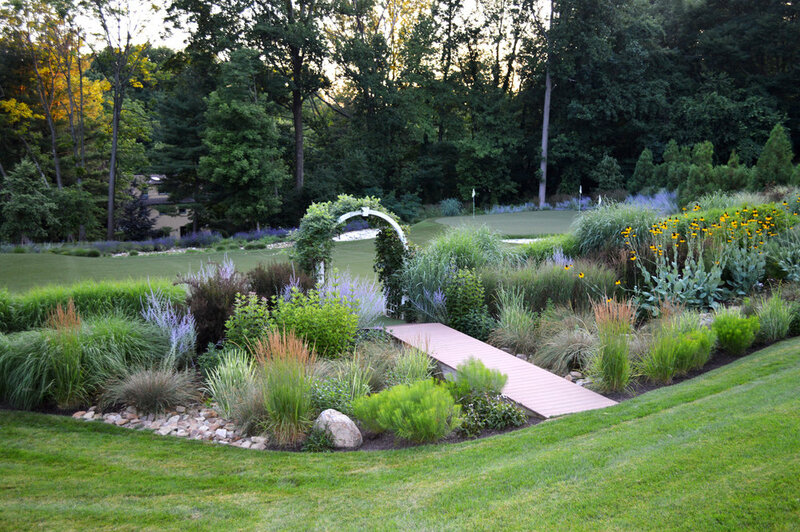 We've done everything from urban gardens to golf courses, but specialize in high-end residential landscapes. On those, we've designed and installed a wide array of projects. These include sustainable rain gardens, hardscape patios and pools, foundation plantings, container gardens, native plant displays, and anything else you can imagine. So if you have something in mind--let us know! We'd love to help you create a landscape you love to look at and enjoy for years to come. 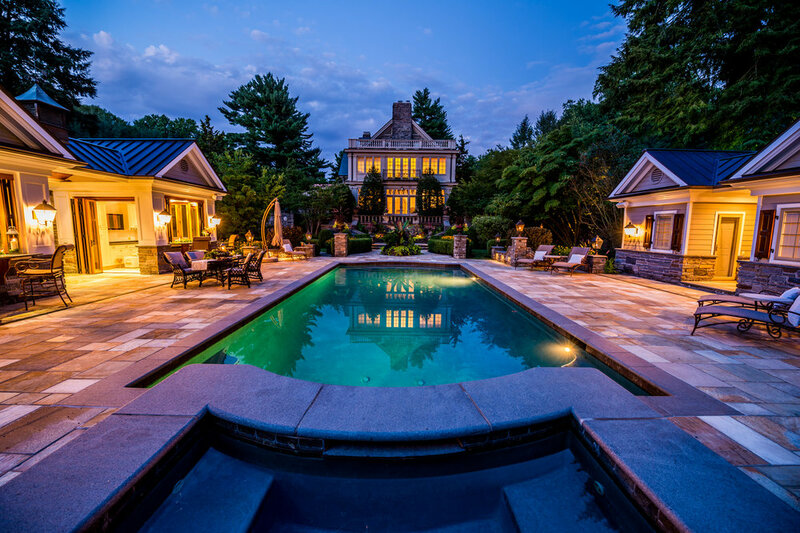 A large-scale landscape design/build incorporating new and existing architecture at this historic Main Line home. This property redesign features extensive hardscaping, native plant design, and outdoor living features. A great project all around. An outdoor kitchen and fireplace are the centerpieces of this intricately built outdoor oasis. View Project "Personal Golf Course"
The intimate personal golf course is great fun. 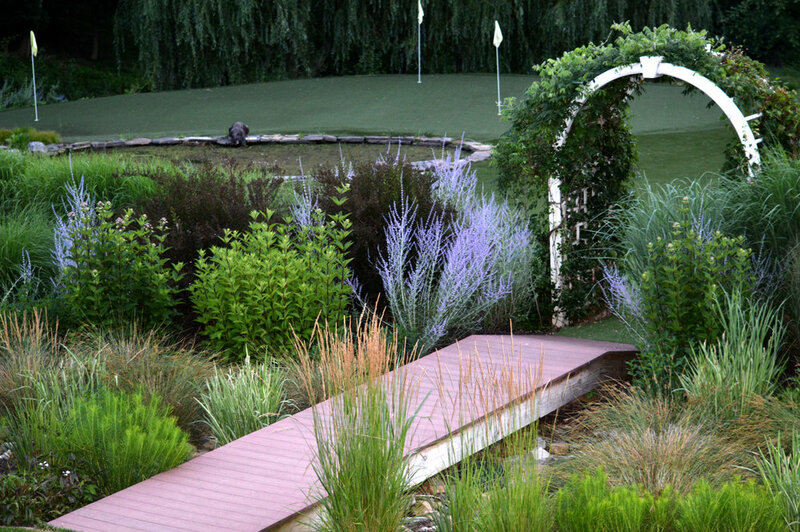 But the real draw here is the amazing perennial garden and wood bridge. Natural stone walkways with Belgian Block borders. Fine stonework combined with old world design aesthetics. Or if you prefer--more modern, stripped-down options are available. Stainless steel components with artisanal masonry perfect for year-round entertainment. With a focus on native plants and sustainable design, the gardens we create are designed to flow naturally within the property and function beautifully for years to come. Property grading and leveling, sod installation, and large tree/shrub screenings to add privacy around the borders. Multiple hole golf courses with no wait time between putts. Also in this picture is a custom wooden bridge over a stream worked into the property design for a natural look. Through a careful property inspection and listening session we discover what you want and what we can deliver, making informed suggestions to you along the way. Once everyone feels confident and excited with the possibilities, our designers brainstorm a set of potential designs to fit your budget(s), deliver satisfaction, and suit your landscape. At our next meeting--or by mail if you prefer--we present our ideas and vision for your property, with a list of designs or master plan you can choose to commission for a fee. The big unveiling! This is where you're presented with the custom, completed designs for your property. 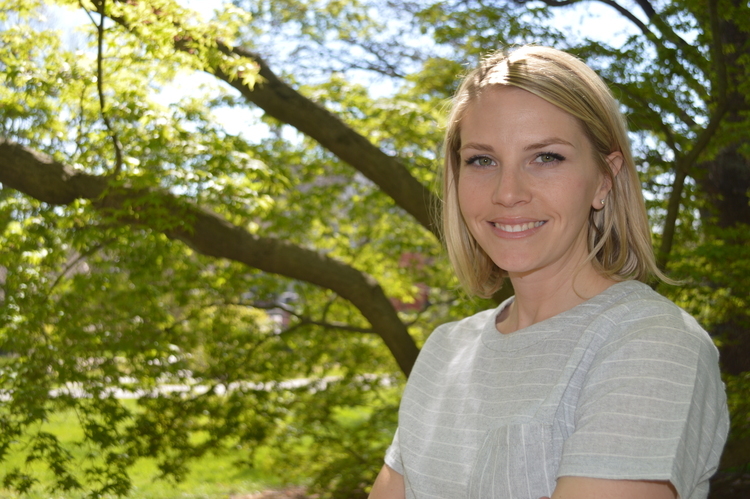 Our award-winning team works tirelessly to create unique, sophisticated plans outlining how best to transform your landscape into what you've always dreamed it to be. Of course, any design is just an idea until it's built. Terren is renown for its ability to build anything with quality and efficiency second to none. We've done the largest estates in the area, for some of the wealthiest individuals in the world. If you can see it, we can build it. After the design is presented, we'll provide a proposal for the build, which can then be revised as necessary before getting started. Our incredible team of uniformed, insured, and trained build professionals show up on time and work every hour they can, getting the build done faster and better than you ever thought was possible. Before you know it--we're done and your paradise has arrived, ready to be enjoyed by you and yours for years to come.